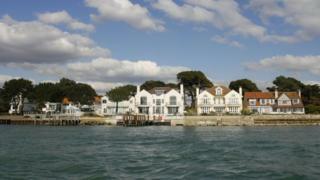 The UK's most expensive seaside town is Sandbanks in Dorset, with the average house price there nearly £665,000, a report has revealed. Salcombe in Devon, where the average home is worth £539,950, came second, Halifax's Seaside Town Review found. The least expensive was Scotland's Port Bannatyne on the Isle of Bute, where the average house price is £77,132. North Berwick has become Scotland's most expensive seaside town, according to a Bank of Scotland report, which says the average house price there is £327,124. Halifax used house price figures from the Land Registry and the Registers of Scotland for the report, covering 196 seaside towns across Britain. Halifax also found that house prices have increased by £440 a month on average in Britain's seaside towns over the last decade. The average property price in the UK's seaside towns has increased by 32% from £166,565 in 2006 to £219,386 in 2016. Martin Ellis, a housing economist at Halifax, said:" Seaside towns are highly popular places to live, offering sought-after scenery, weather and lifestyle which no doubt come at a price. "They also attract those looking for holiday properties, which add upward pressure on house prices."